Today I would like to share with you some pictures my niece took. She was visiting her boyfriend´s parents and what do you think she found? Well, pink of course! The pictures are so inviting, makes me want to spend lots of time in that garden. Happy Pink Saturday Everyone! Be sure to stop by How Sweet the Sound for some more pink! I will paint something for my garden that color pink. How Gorgeous!! Love It.Happy Pink Weekend! One thing is for sure, her boyfriend's parents have one beautiful garden. Wow! What an incredibly gorgeous spot. I would have to sit down on that pink bench and enjoy the beauty. I am so glad you shared with us. Wow! How gorgeous! Would love to sit right down there and drink in all that beauty! Thanks for sharing and Happy Pink Saturday! I can just smell those lovely pink roses! A stunner of a scene. 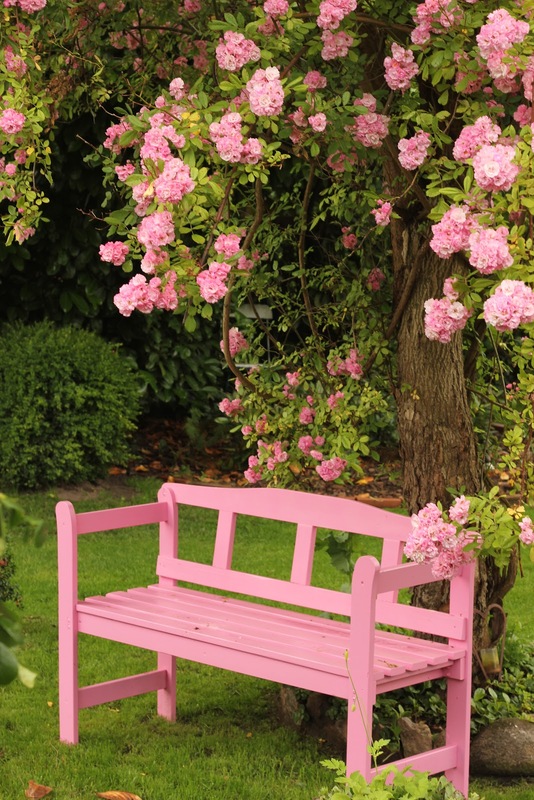 Wish I had the courage to paint my bench pink! Gorgeous, and did you see Beverly chose your post as the one that caught her eye last week?